The new Audi A6 40 TDI Saloon is comfortable, refined and economical on the motorway, it’s spacious and features a high-tech dashboard, and it even has a mild hybrid diesel powertrain. There have been lots of anti-diesel messages in the media over recent years, and there’s also a trend of everyone moving into SUVs, but a large diesel saloon can still be an efficient way to cover lots of motorway miles. The latest Audi A6 is designed exactly for that purpose. And from a green point of view, the interesting news is that this A6 is a MHEV, ie. a ‘mild hybrid electric vehicle’. So does this MHEV system revolutionise the A6? There are no big surprises with the base powertrain for the A6. It has a 4-cylinder, 2-litre turbodiesel engine, 7-speed S tronic transmission, and front-wheel drive. However what is new is the mild hybrid (MHEV) system. This 4-cylinder A6 has a 12v MHEV system, but the 6-cylinder models have a more powerful 48v system. 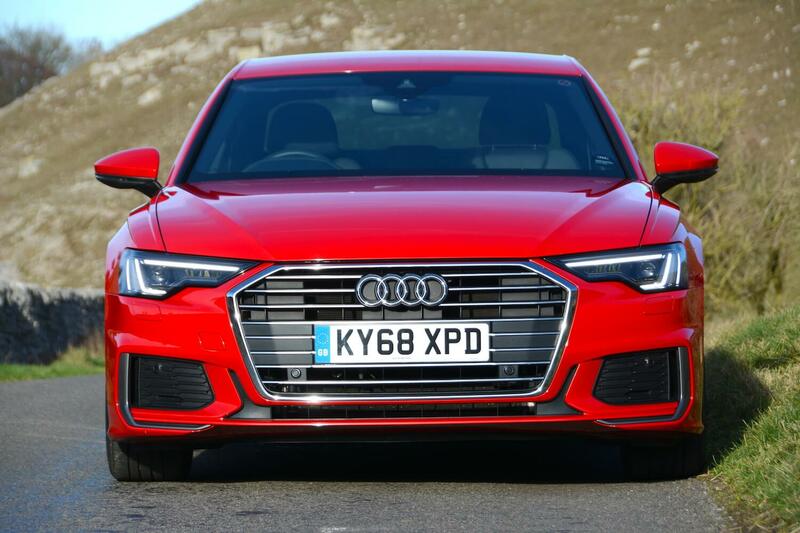 It means the A6 can coast with the engine off, including at motorway speeds, the start/stop can kick in earlier, and the idea is that the system can aid the engine to reduce turbo lag. The A6 exterior is an evolution of the previous model, although the styling does look lower and more sporty. 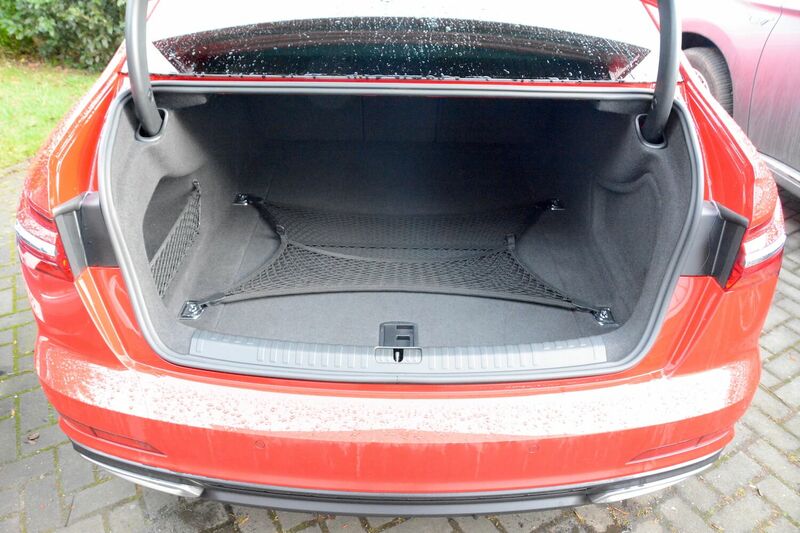 Inside, there’s lots of space, particularly in the boot, and for rear seat passengers. But this is a big saloon, so it should be spacious. 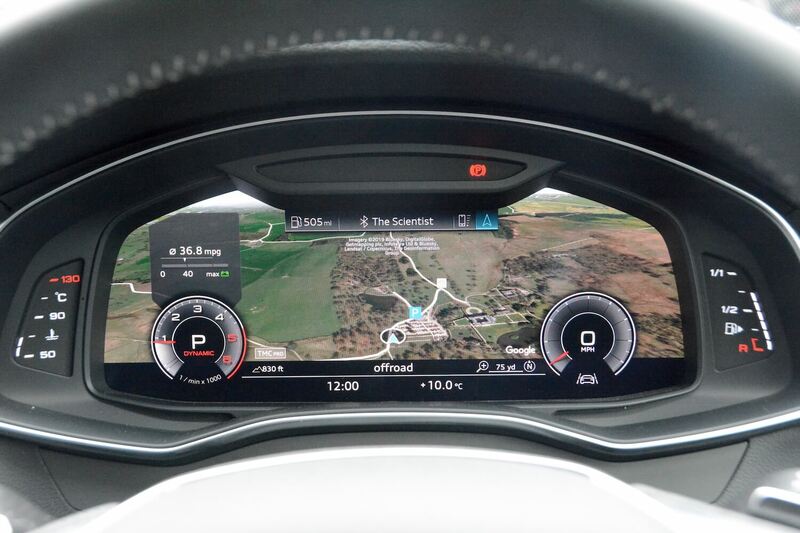 From the driver’s perspective, the dashboard is very high tech, with lots of information in lots of screens. The interior also features high quality materials and overall it’s a high quality environment for driver and passengers. 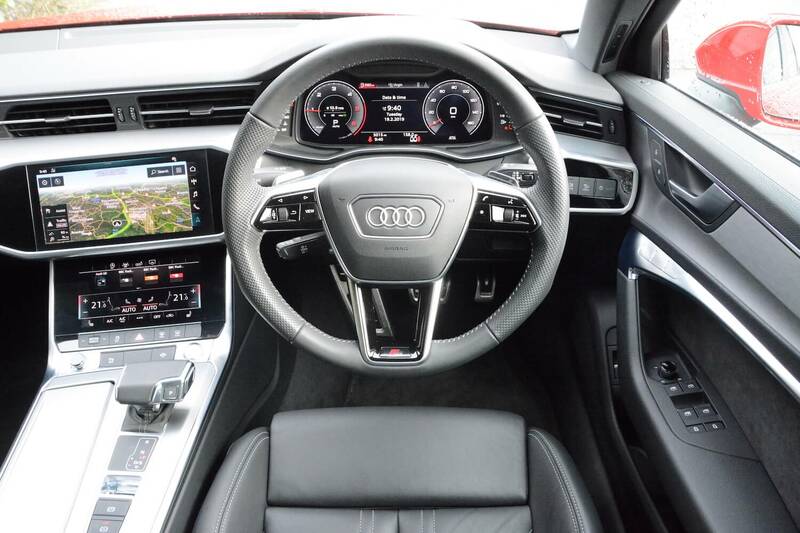 If you like lots of high tech screens then you’ll like the interior of the A6. You’ve got a digital instrument display, a touchscreen for the satnav and infomedia (featuring a big, clear reversing camera), and then below that a separate touchscreen for functions such as climate control. 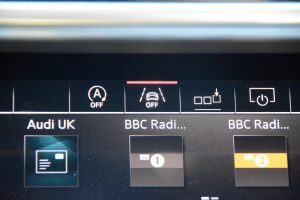 There are no physical shortcut buttons for the main touchscreen but there are five buttons located on the screen to take you to home, satnav, radio, media and phone. When you finish trying to take in all the information on all of the screens and start driving, it doesn’t take long to confirm that the A6 is in its comfort zone sitting on a motorway at 70mph. When doing this, it’s refined, comfortable and economical. When you turn off the motorway you’ll soon realise that the A6 isn’t designed for acceleration or corners. Once you’re accelerating, it’s fine. The issue is trying to accelerate from standstill onto a busy main road from a side road, when you’ll experience what feels like a very, very long delay between pressing the accelerator and resultant forward progress (which is even worse if the stop-start has previously kicked in). And because the A6 is front-wheel drive, this delay can turn to wheelspin when the transmission wakes up and when the turbo kicks in. 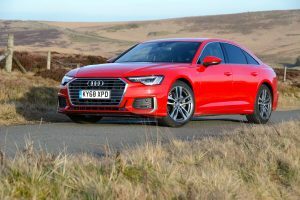 If you then drive on a twisty road you’ll soon find out that there’s very little feeling from the steering or from the handling department thanks to the front-wheel drive chassis. If you then drive on a road with white lines you’ll find the steering wheel being wrestled from your hands if you dare to cross the white lines without indicating. 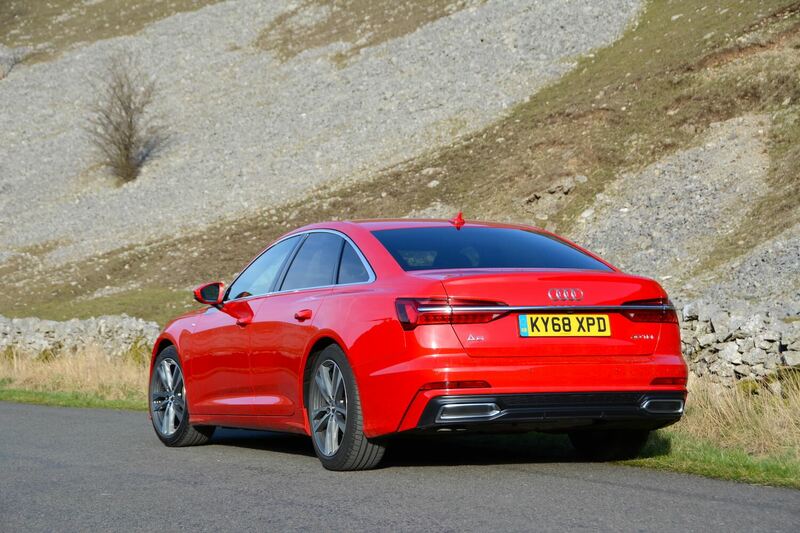 The lane departure warning system isn’t only found on the A6, it’s on most new cars. It concerns us greatly that drivers are now seemingly so incapable of keeping a car between two lines that technology is fitted to intervene to achieve this. We still believe that the default should be that such systems are switched off, but if someone gets into a car and intends to fall asleep at the wheel, or if they are just a very, very bad driver, then they press a big red button which switches on the lane departure warning system. Anyway, the point is that the A6 doesn’t have involving steering to start with, but when the car pulls the wheel out of your hands when you cross a white line on a deserted dual carriageway, it ruins the driving experience completely. However, we have a solution. 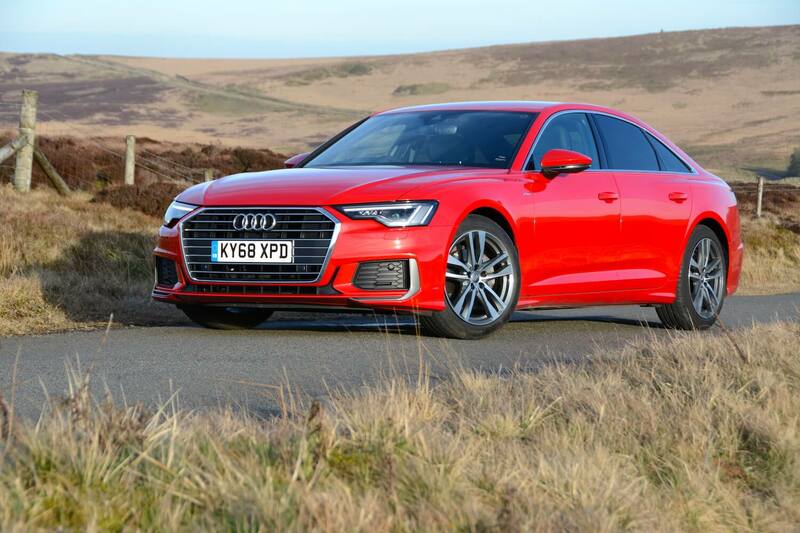 In fact, you could call it a guide to how to drive the new Audi A6. So, if you’re sitting on the motorway all day, and you’re feeling as though you can’t really be bothered to drive, just leave everything as it is. But, if you want to actually drive the car, and not have the experience ruined by technology, then follow these instructions. The first, and most important piece of advice, is to switch off the lane departure warning system. Many cars have a button under the dashboard to the right of the steering wheel to do this. Or sometimes you can access this by delving into menus and sub-menus on the touchscreen. However the A6 employs neither of these approaches (although you can adjust the level of driver assistance in the touchscreen but you can’t switch off the LDW). 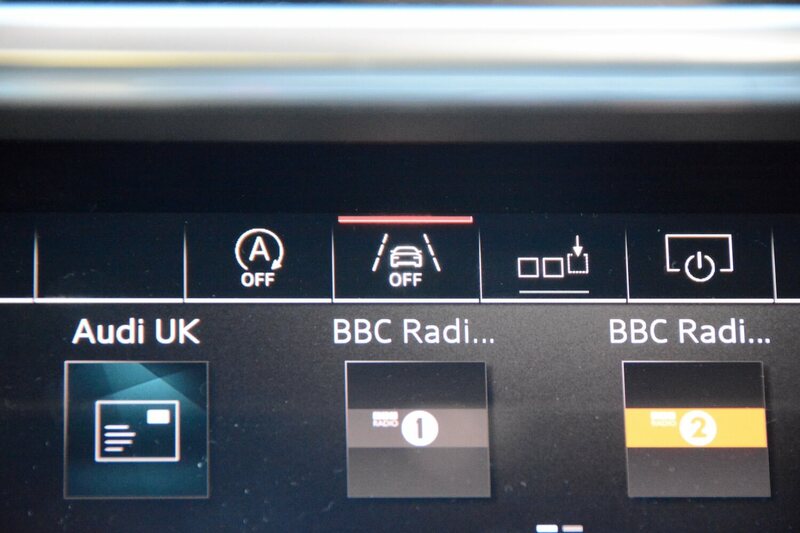 Instead there’s a small button at the top of the climate control screen. Knowing this when you get in the car will save many miles of pain. Then there’s the issue of the slow response from standstill. To help mitigate this, select ‘Dynamic’ from the five drive modes of Efficiency, Comfort, Auto, Dynamic and Individual. Then, when the 7-speed S tronic transmission is in Drive, pull the gear selector back to access Sport mode. This doesn’t fully solve the problem of slow response from standstill, but you’re now doing everything you can to improve things. If you’re feeling really adventurous, you can change gear manually using the steering wheel mounted-paddles to provide a feeling of greater involvement. If you’re really brave, you can also switch of the traction control. The official WLTP combined fuel economy for the Audi A6 40 TDI 204PS S line S tronic (MHEV) is 47.1 – 50.4 mpg (depending on wheel size) (standard wheels are 18-inch) with CO2 emissions of 117 g/km. But what we did get in real-life? We achieved 63.8mpg at 50mph on the motorway, and 56.4mpg at 60-70mph on the motorway. On A roads the A6 returned 47.0mpg. Overall, after a week of mixed driving, we averaged 44.4mpg. So did the micro-hybrid tech make a noticeable difference? Not really. One big plus point for the A6 was a projected driving range of over 700 miles on a full tank. That remains a huge advantage of a diesel car compared to an electric car. The Audi A6 40 TDI 204PS S line S tronic costs £41,110. Options on our test car consisted of the ‘Tango Red’ paint colour (£685), front sport seats (£1,000), privacy glass (£475) and Technology Pack (£1,495). With delivery charge, first registration fee and £205 road fund licence, the total cost of the test car was £45,655. Engines for the A6 range are comprised of a 55 TFSI Petrol, 40 TDI Diesel and 50 TDI Diesel, and trim levels are Sport or S line. 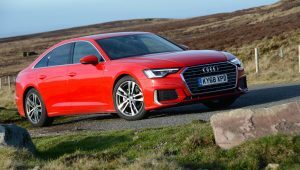 You can buy an A6 Saloon, A6 Avant or A6 allroad quattro. Prices start from £38,640. 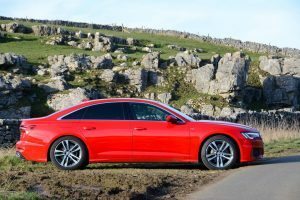 The Audi A6 40 TDI 204PS S line S tronic (MHEV) is a feel-good car if you spend lots of time on the motorway. The dashboard looks very smart and is very high tech (although you are left with the feeling that there must be a way to simplify all the information on the various screens, as it can be a bit overwhelming). 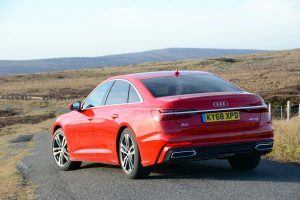 The A6 is comfortable on the motorway, and we averaged 56.4mpg at motorway speeds, which is a big step forward from where cars in this class were a few years ago. So if you want a big saloon for lots of motorway miles, this should be on your list. However we’re left with the feeling that cars such as the A6 are not at the top of people’s wish lists at the moment. Everyone wants an SUV, and despite the very latest diesels being economical, and much cleaner than older diesels from an air quality point of view, many people are being scared away from diesels due to stories in the media. Since the new WLTP economy and emission test came in for most cars last September, virtually all 4-cylinder diesels that we’ve driven have had very slow responses from standstill, and the A6 is no exception. Add to that the annoying lane departure warning system – a feature of most new cars – and the driving experience if the A6, which is essentially a good car, is impacted. And the Audi’s main rivals, the BMW 5 Series and the Mercedes-Benz E-Class, are both rear-wheel drive, rather than front-wheel drive as is the case with the Audi. Rear-wheel drive delivers more rewarding handling, and frees up the front wheels to focus on steering. So the Audi A6 40 TDI 204PS S line S tronic (MHEV) is awarded a Green Car Guide rating of 7 out of 10. Personally we would vastly prefer the A6 allroad quattro in 50 TDI Diesel form; although we’ve not driven this latest version, based on previous models, this is a much more practical car with a much better engine – although it will be more expensive, and won’t be as economical as this A6 Saloon. Of course the solution to slow reactions from the diesel powertrain is a pure electric powertrain, and we’re due to review the brand new all-electric Audi e-tron very soon. And the e-tron powertrain is clothed in a – yes, you guessed it – SUV body. 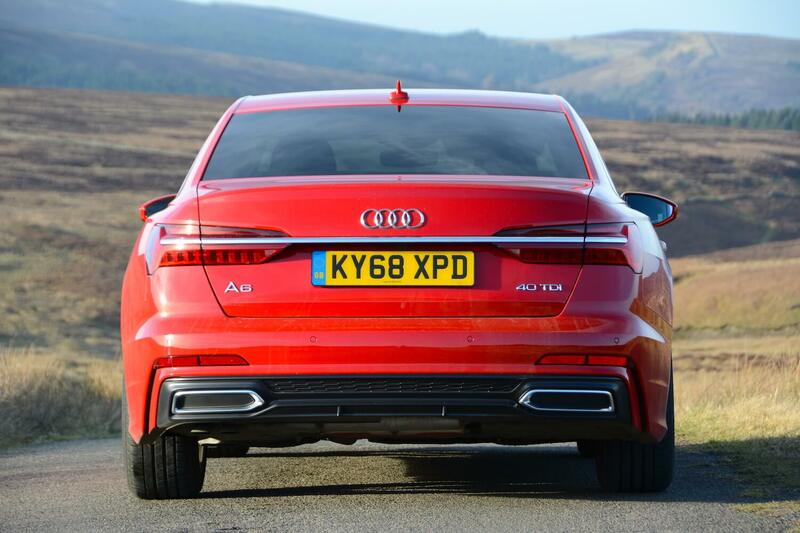 The A6 may be the latest evolution of a large saloon, but when people drive the e-tron compared to the diesel A6, they’re likely to see electric propulsion as the future.